The study of science should engage and excite students and feed their natural curiosity and sense of wonder about the world. The ByDesign program is dedicated to this purpose. 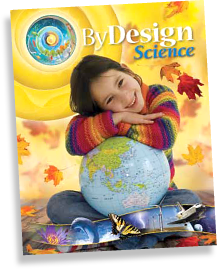 The North American Division has developed a new grade 1-8 science series called By Design. When we began to investigate a new science adoption in 2011, it was decided that we could no longer place a secular science textbook on the desks of our students. So, with much prayer and considerable effort we designed and implemented a distinctly Adventist and robustly academic textbook series. These textbooks are inquiry-based, and have a thorough and rigorous science foundation, while still presenting a comprehensive Adventist worldview. All grades, 1-8, will be available by September, 2014. At this time we are beginning work on a sophomore level biology textbook that will complement the elementary series. The division is committed to providing our students a strong science program, including the introduction to evolution within the context of what is truth and God as the Creator. With both the elementary and secondary textbooks, we have developed online support for teachers, such as test banks, additional resources, and eTextbooks for students. We invite you to check out the new series and help your students to get to know Jesus through science.